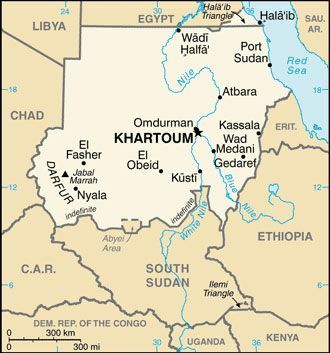 Sudan has a long history of war and civil unrest, with various conﬂicts involving multiple actors and regions, underpinned by ethnic and religious tensions, as well as power struggles over resources in the oil rich country. Several groups based on ethnicity, religion and geographical location have been systematically marginalised and excluded from social, economic, cultural and political life of the country. This trend that has continued since the colonial period and accentuated by post-independence authoritarian Islamist governments that are centralised in the capital, Khartoum. Persistent marginalisation has led to decades of civil war and the secession of South Sudan, as well as conﬂict and violence in Darfur, Eastern Sudan and in Abeyi, Kordofan/Nuba Mountains and Blue Nile states. The ongoing conﬂicts throughout Sudan are characterised by widespread human rights violations, including allegations of ethnic cleansing and genocide, systematic perpetration of sexual violence, murder, dispossession and targeting of Christian and African communities. The role of Sudanese women in the myriad of different peace processes varies by region. However key women leaders and women’s organisations have played important roles, both formally and informally, consistently transcending conﬂict divides. However, though women are not homogenous, with multiple ethnic, religious, tribal, regional and language-based identities, Sudanese women’s participation is commonly constrained and discriminated by patriarchal structures regardless of these different identities. Monash Gender, Peace & Security is a group of policy and community engaged scholars whose research is focused in the field of gender, peace and security. We seek to use our research to inform scholarly debate, policy development and implementation, public understanding about the gendered politics of armed conflict and the search for peace.